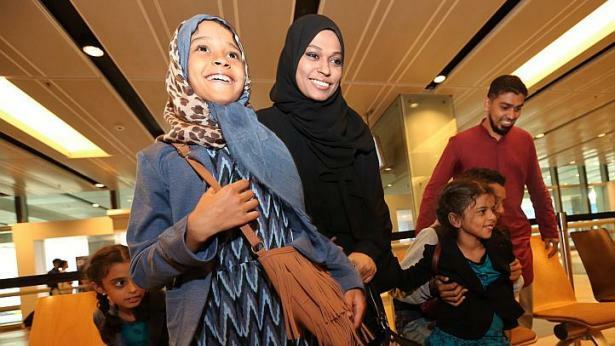 Dizzy from relief and fatigue, Madam Sherin Fathimah took a few unsteady steps as she walked out of the arrival hall at Changi Airport yesterday afternoon. Just three days ago, Madam Sherin and her children, aged between four and 13, began their hair-raising evacuation from Yemen, which has been rocked by fierce clashes between Shi’ite rebels and loyalist militia. They did not even dare speak a word as their car edged towards the port in Aden, where a Chinese ship they were due to escape on was docked. “Tanks were firing at each other along the destroyed roads. The driver had to detour and use the small alleys to get to the port,” said Madam Sherin, who had been living in Aden with her Yemeni husband since last September. Her husband did not go through the ordeal as he had gone to Saudi Arabia for a pilgrimage before tensions heightened. Unlike his mother who only managed weak smiles and tentative hugs as she was clearly shaken by the events of previous days, 13-year-old Ahmad Ramzy jumped and waved at relatives as he emerged from the hall. Still, he admitted that the past week had been traumatising. Last Thursday, he rushed back home from school when the battle got too close for comfort. “I was walking into class to take the Turkish mid-year exam when I heard gunshots, so I ducked and ran out like all the other students,” he said. That was when his mother got worried and asked the Ministry of Foreign Affairs for help in getting out. The ministry eventually managed to secure places for her family on a Chinese vessel bound for the African state of Djibouti.